This is a theory that was given the name “The Big Break Theory” by TPI Advisory Board member Dr. Tom House and myself. We have noticed that there seems to be a strong correlation between the longest hitters in the world and a history of speed training in the opposite direction. In other words, if they were a right-handed golfer, they would train for speed left-handed. Many high level golfers compete or practice explosive speed in the opposite direction. From playing hockey left-handed, to pitching left-handed, to switch hitting in baseball, to running backwards, it doesn’t seem to matter. What matters most is the development of speed in the opposite direction. Our theory is that you will only accelerate to the point of which your body knows you can safely decelerate. Therefore, the stronger and faster your decelerators are, the faster you can develop your accelerators. For example, some of the fastest runners in the history of the NFL are cornerbacks. They spend half their time running backwards. Coincidence, maybe? 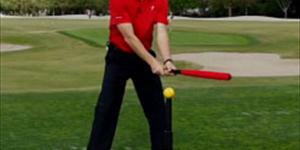 There is also the argument that training the opposite side of the body helps maintain symmetry and mobility, which is beneficial regardless of what direction you are swinging. We even add opposite side swings to the warm-up of most of our players. Funny, my son takes pitching lessons from a Tom House protege and we've talked about the decelerators in relation to improving his pitching velocity. I wondered if this was true too about the golf swing, so I guess the answer is yes. I've learned a good deal about my golf swing by listening to his pitching and hitting lessons and then thinking about the golf analogue. Thanks! I would be a little careful hitting against a tire or an impact bag. I have seen many injuries caused by the exaggerated forces generated in the body from hitting a object that hits back! Greg, I used to hit a tire lashed to a tree with a baseball bat as a kid. I felt the hardest part of the swing was after contact when it was bouncing back and I was trying to stop it. Can this help power in golf and are we training the same opposite muscles? Absolutely - many of this type of research had its roots in baseball! This exercise helps build hand-eye coordination, speed and batting skills. 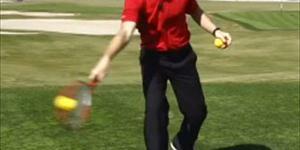 This exercise helps build hand-eye coordination, speed and striking skills. This helps develop speed, power, kicking skills and single leg balance.